Icube Tivizen Nano DVB Terrestrial Receiver, Tivizen nano is a powerful and innovative DVB Terrestrial receiver that your iPad and iPhone or Android Tab or smartphone makes to a mobile television, without you having to need an internet or 3G connection. 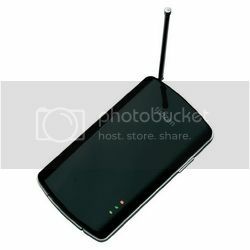 Tivizen nano connects via WLAN / Wifi using your device. Tivizen nano transmits the TV signal wirelessly or without a cable with a very high coverage directly on your device. Download free Tivizen nano app on the App Store for Apple devices or Google Play for Android devices and install. Sony Xperia IoN, Sony Xperia T. ..
iPod Touch 3rd & 4th generation.